Popeye Village, aussi connu sous le nom de Sweethaven Village, est un ensemble de maisonnettes en bois situé à Anchor Bay, dans le nord-ouest de l'île de Malte, à quelques kilomètres Mellieħa. Il est créé pour servir de décor et de lieu de tournage de la comédie musicale Popeye, sortie en 1980, avec Robin Williams dans le rôle de Popeye. Il est aujourd'hui ouvert au public comme musée à ciel ouvert. I would guess the place was once very attractive and popular. The place now is getting a bit run down and in need of a lot of repairs. Some of the houses or attractions are off limits which make paying full price a bit pointless. If so much is off limits, they should reduce the price. Despite the facility being a bit run down or off limits though, i have to give full credit to the staff that perform. They really give it full energy and entertainment value. Despite the high heat, they put of a brilliant performance. Fantastic place to visit for all the family. 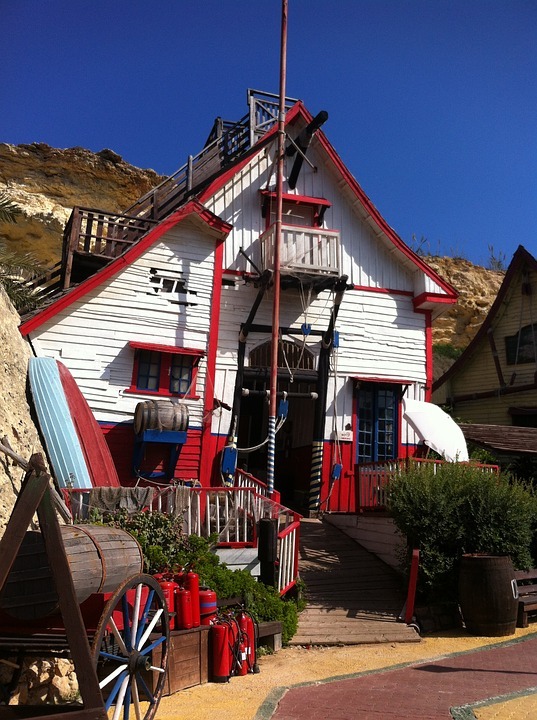 You can explore the film set of the Popeye's village and go into each house to look around and play. There is also mini golf, a boat ride and shows taking place throughout the day. Sunbathing loungers are available as well. To eat and drink there is a small cafe serving the use overpriced eats and drinks and a WiFi area. But the best thing about Popeye's village is taking part in making your own version of Popeye the move! For €7 you can get a copy of the film you stated in made by Popeye himself! Best fun I have had in Malta!! Not to be missed. Amazing place, so many lovely details! I haven't watched the movie yet but now it is on my list. I also feel weirdly more attracted to spinach now. We went on a Saturday and it wasn't too crowded. Very enjoyable and in my opinion completely superior to the overcrowded Blue Lagoon. The place itself is very beautiful and I enjoyed walking around the set, however I must admit that it is much more tailored towards children. If I was younger I would have surely given this 5 stars! The entertainers seemed lovely. The boat was also not working on a seemingly sunny day and that was supposed to be provided for free with the entry ticket. It's a good place in Malta to visit with your kids. Swimming pool with slides during summertime. They are continually making improvements and when we visit in May they made new houses and fixing the others. All without disturbing the visitors (to much). Nice place to spend a couple of hours or even more if the kids are going to swim.